Details relating to the German Commemorative of 2011. This is the sixth of the German series of commemorative coins representing the provinces of Germany. This one represents Nordrhein-Westfalen. The Cologne cathedral (Kölner Dom), a Roman Catholic church in Cologne was chosen to represent Noedrhein-Westfalen. The cathedral was designated an outstanding example of Gothic architecture and joined the UNESCO World Heritage. The cathedral is depicted in its entirety in the inner circle, looking directly at the south portal. The mint mark is shown in the inner circle at one o’clock and the initials “HH” of the designer at three o’clock. The country designation “D” is shown in the outer ring between twelve and one o’clock and the year of issue 2011 at the bottom of the outer ring. 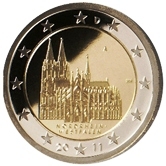 Return from German Commemorative 2011 to euro coin collector.